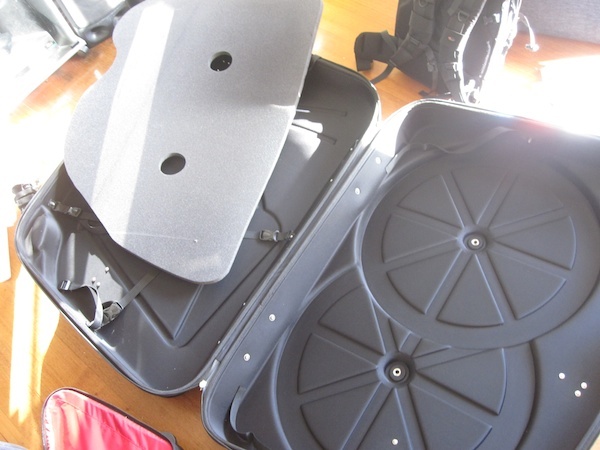 In this post I show How to pack your bike in the Polaris bike pod which also includes OEM bike pods. Read my Polaris Bike Pod review. The BikePod used in this post is a generic OEM case, not a Polaris. 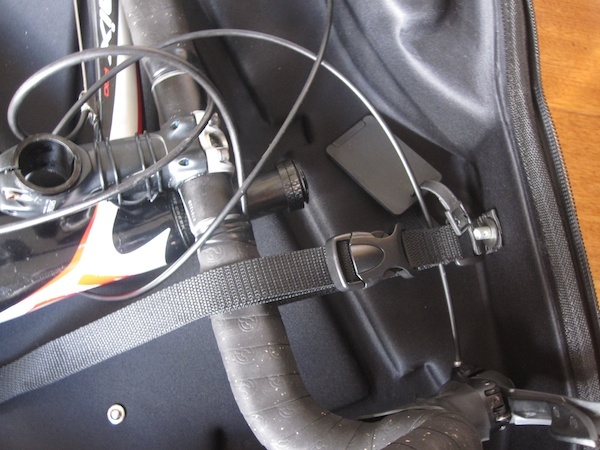 With most bike pods and cases, you need to remove your pedals, handlebars and seat (or else lower the seat). 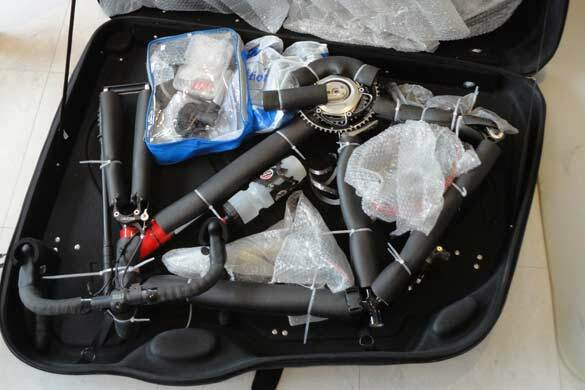 So we do this in step 1, and remember to put the fork cap back in, with the spacers, and put some electrical tape over it, and the stem screws on the stem, to stop them working loose and going missing in transit (trust me, it happens). 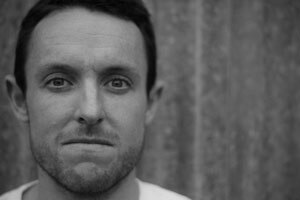 Put the pedals in a plastic bag. We now open our bike pod. Laying the case flat with the wheel side down, the wheels are added, and the (usually) provided skewers are used to hold the wheels in place. Do not use your precious skewers. They WILL be damaged. The bike pod used in this post works reasonably well in this respect, however the skewer for the front wheel is too long, meaning the spring is ineffective. As you can see below, the front wheel rests on the back wheel. 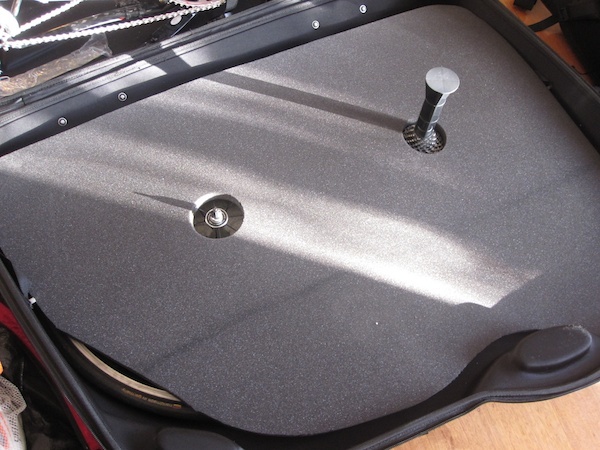 In transit, the case may be stored upright, which would reduce in pressure on the spokes, however I don’t like to take chances, so you could add some bubble wrap or an old towel here to protect the front wheel spokes. We now lower the foam wheel cover. Note the black plastic brace. 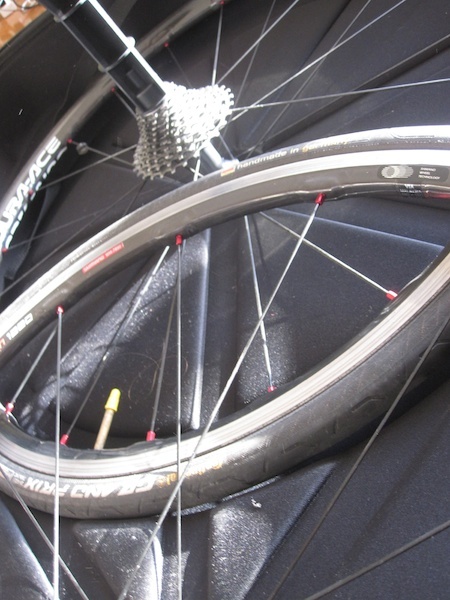 This screws into the back wheel skewer and proves a brace across the pod to prevent the wheels bring pressed into the bike frame. 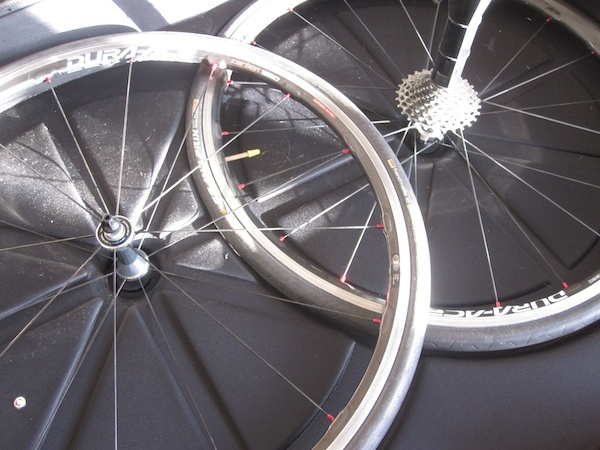 A second, shorter, one is provided for the front wheel, however the front wheel skewer provided wasn’t long enough to allow me to thread the brace on. I had to leave it off, and finish the skewer with the standard cap, hence my comment above about the skewer being too short. Next, we put the other side of the pod flat on the ground, and lay the bike frame in. Many bike pods have an imprint showing how the bike is to be positioned. Laying it flat, I secure the handlebars down. For added protection, put some bubble wrap around the stem, to protect the frame. In the next step, we secure the fork. 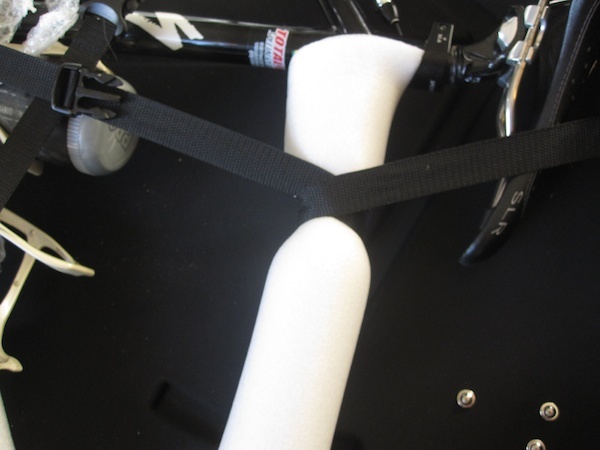 If your bike pod doesn’t come with foam as shown in the picture, use bubble wrap or similar. Again, foam is used to protect the frame. 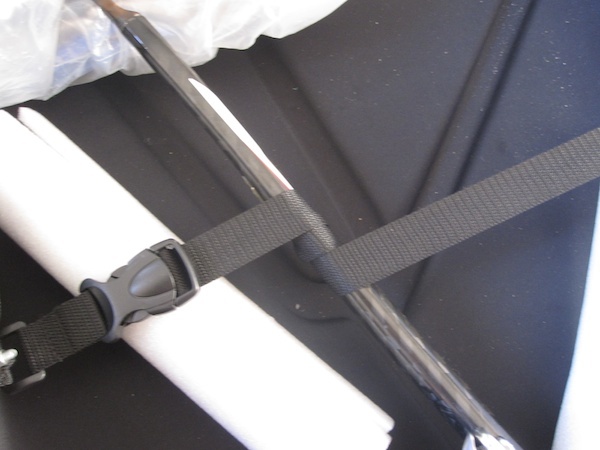 I have wrapped the strap around the frame to aid the bracing. You could use the foam to protect the fork you’re wrapping the strap around. Before fully tightening the straps, bubble wrap is added generously to the rear derailleur, cranks and fork ends. In the image below, you can see some plastic in the bottom right. This is my tool bag which I wrapped in plastic. I then took the old blue polyester blanket you can see top left, and wrapped it around the forks, seat, rear stays and underneath the frame. I then added some clothes and other soft items (in ziplock bags) to aid padding. One Around the World flight with no damage. 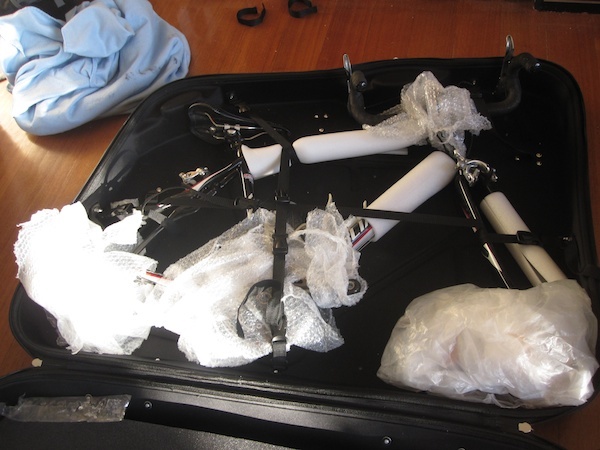 The same principles can be applied whether packing your bike in a hard case or softcase. Head over the VeloNomad Bike Travel Bag Reviews page for more info about all the main Bike Travel Bags and my reviews of them.